There’s more to Microsoft Word than writing a cover letter. In this beginner-level course, you’ll learn the full capabilities of the popular document creation program. Learn how to use the interface, ribbons and tabs and make your documents stand out from the rest. You may have used Microsoft Word to type a document but have you discovered all of its capabilities? In this course, you’ll walk through the beginner-level functionality for the major elements of the program. 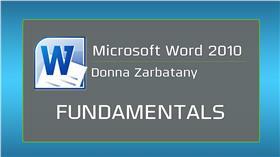 The fundamental uses of the Microsoft Word interface. The elements of the quick access toolbar. How to use dialog box launchers. The technique for accessing the Backstage View. How to use the navigation pane. The differences between blank and template documents. Multiple ways to create, save, open and close documents. How to minimize and expand the ribbon. The full functionality of the ribbon and its tabs, including Insert, Page Layout, References, Mailings, Review and View.